With the ongoing discussion about the halal market and in particular on the issue of ‘halal stunned’ and ‘halal non-stunned’ meat and poultry, each week we hear that non-stun is a cruel and barbaric; yet all forms of killing could be considered to be cruel and barbaric. There is no such thing as nice slaughter, slaughter is slaughter to kill an animal. People are focused on the last 10 seconds of an animal’s life and are prepared to ignore what has happened before it is slaughtered. All they are trying to say is my killing is nicer than your killing, and continually attacking the slaughter methods of the Muslim and Jewish communities with little or no basis. Indeed, there are far more important issues on animal welfare and cruelty that are being ignored for cheap headlines, ignorance and political gain. If we are really concerned about animal welfare we should address the following 11 areas that highlight blatant cruelty perpetrated on animals in the UK. 1. The pain caused when tagging an animal – every large farm animal must be tagged in the UK for the purpose of identification. 2. Chickens bred for eggs fair worse. Soon after hatching, chicks are sexed. Whilst the females have their beaks forcibly removed before being moved on to laying. The males are thrown into macerating machines that grind them up – while alive – for use in animal feed, approximately 50% of all chicks hatched for this purpose are therefore brutally killed we are talking about over 18/20 million per week. 4. Animal Welfare Regulations allow surgical castration without the use of any pain-relieving drugs for calves up to the age of two months. 5. Animal Welfare Regulations also allow emasculator or Burdizzo castration without the use of any of pain relieving drugs for calves up to the age of two months. This method of castration uses a clamp which crushes the blood vessels around the testes, cutting off blood supply and causing them to die and drop off. 7. More than 30 million egg-laying birds are kept in battery cages in the UK at any one time. They are fed and live under artificial light until their egg laying days are over when they are slaughtered. They go from egg to slaughter without ever seeing sunlight. Wire cage sizes are just 450 sq cm – less space than an A4 sheet of paper per bird. From 18 weeks of age she will remain for a year and will produce around 300 eggs. 8. Animals on a farm are routinely castrated or dehorned without any pain-relieving drugs. 11. It takes 12 sec for a sheep to die in non-stun yet it takes over 7/9 min for pigs to be suffocated by the new method that is called CAK (controlled-atmosphere Killing) this method is RSPCA and Humane Society approved. The same could be said for chicken’s whether they are stun or non-stun takes 90 sec to die yet it takes over 5/7 min for them to die using the new method of CAK by suffocation. · Dumping and shackling live birds causes broken bones, bruising, and hemorrhaging—all of which lower carcass quality and yield. · Birds scratch and peck each other—and vomit and defecate on one another—which causes carcass contamination. · Birds often inhale the pathogens in the electric water bath, resulting in carcass contamination. · When they are scalded to death, birds defecate in the defeathering tanks, contaminating all the birds who are submerged afterward. · The millions of birds who are scalded to death each year are condemned and cannot be sold, further lowering yield. · Low light in the dumping and shackling area—maintained to reduce the birds’ struggling—creates a poor working environment. · The birds flap violently during handling, defecate and vomit on workers, and kick up dust and debris—including dried feces. This increases illness and injury rates, creating worker welfare problems and raising costs for employers. · The overall poor working conditions result in an extraordinarily high turnover rate among slaughterhouse workers: an annual average between 75 and 100 percent. We hear much less (if anything) about the welfare issues mentioned above from the likes of BVA / RSPCA and hear no mention of boycotting products or farms that show such cruelty. It appears that we need to show a greater balance in their comments and avoid unfairly criticising Muslim and Jewish methods of slaughter for food as probably they see them as soft targets. 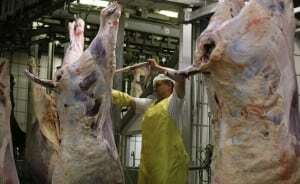 Any such criticisms they made against religious slaughter methods shows them to be ill-informed and insensitive to the halal and kosher consumers as well as ignorant of the huge halal market in the UK, Europe and the throughout the world. The market is changing for halal here the in UK all reports that have been carried out state that given the choice the Muslim community wants non-stun, in fact evidence has shown if a product is labelled halal stunned or labelled non-stunned only the non-stunned is picked up by the Muslim community. Very rarely will a Muslim community pick up a product if its labelled as stunned, which is why no halal producer will never label it as stunned they will only label it halal. With the consumer now asking for true labelling it will force this issue. In fact its unethical for companies who are doing halal but not advising consumers that they are slaughtering halal. Insteadnthey are forcing people to consume halal when they don’t want to, or in some cases it might be against their religious beliefs. What I have noticed is that more and more Halal Certifiers are looking at non-stun methods as the way forward. Even Halal Food Authority (HFA ) one of the largest Halal Certifers in the UK have created a new body which is called Traditional Halal for non-stun. With more mosques demanding that all products be clearly labelled as stun and non-stun this will allow the likes of Trading Standards to enforce this by using the Labelling Act, and not just depend on the word ‘Halal’ on the front of the packaging. I have also noticed most halal certifiers hide their name at the back of the packaging and only HMC brand their name on the front of the package that says it all. All communities have the same rights as the whether they want to consume halal or not, and their should be requirements regarding how their meat/poultry has been slaughtered. Naved Syed is Halal adviser to YABA and the above are his views on the topic of Halal slaughter and the controversy surrounding it.